Here is a fun Homemade Bird Feeder project that has a twofold bonus – it is a fun, simple activity to do with the kids and a nice way to treat your backyard feathered friends. You can do this project pretty inexpensively and it creates a lovely decoration for your yard (at least until the birds devour it). 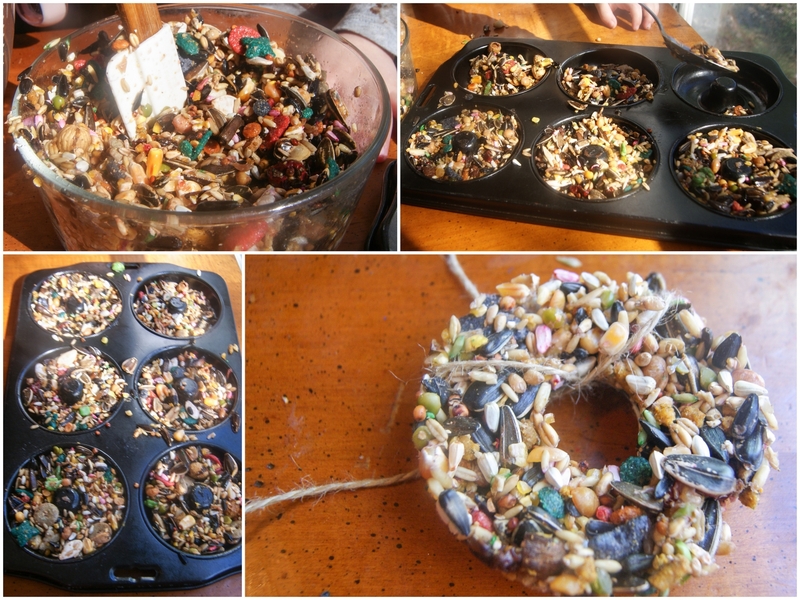 The little ones loved making these sweet decorative snack for the birds visiting our yard. I love that it gave them an opportunity to think outside of themselves. They can be made in a wide variety of containers and shapes, they would make a lovely gift for Grandma or a neighbors yard as well. Sprinkle gelatin over ½ cup of cold water, let sit for 5 minutes. Heat 1 ½ cups of water in a pan, just below a boil. Pour heated water into cold water, and stir until gelatin is completely dissolved. Stir in birdseed, coating it all well. You can use any type of container for making your hanging bird feeder. If nothing else, you can use those small paper disposable cups. If you use a shape like that, place a 10” length of string or twine in the center of your mold, cup, tin, or pan, leaving a long enough end to tie off to a branch. Press mixture into your container firmly, covering at least 3″ of string to make a secure holder. I happened to have a donut pan on hand and used it for our bird feeders, I love how they resemble a little welcoming wreath hanging in the tree. Since it left an open hole, you won’t need to add the string until after your bird feeders are formed. You can use a cookie cutter to create unique shapes by pouring your seeds into individual cookie cutters onto on a piece of aluminum foil. Insert a straw or stick at the top to create a hole for hanging, once gelatin is set, remove straw and cookie cutter and attach your string. Allow to set overnight for best results. 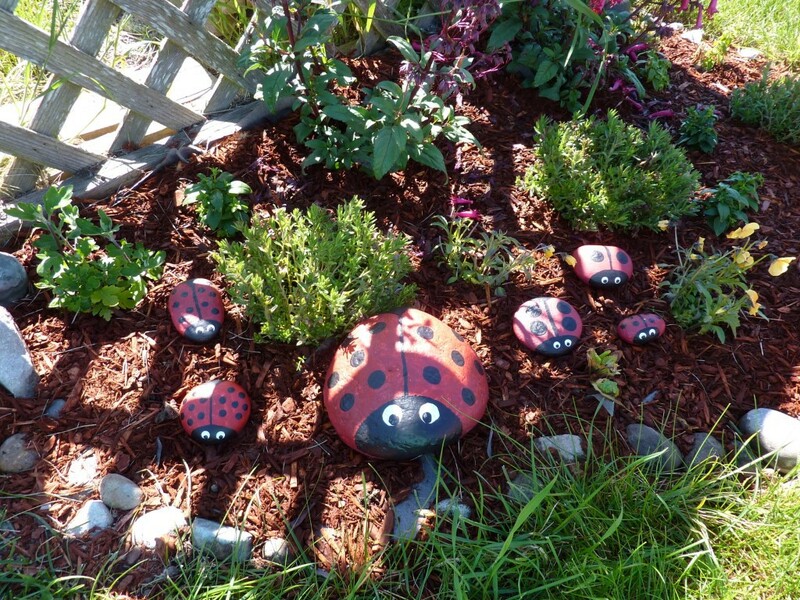 Here’s another fun project you can do with the kids to spruce up your backyard, paint Ladybug Rocks! 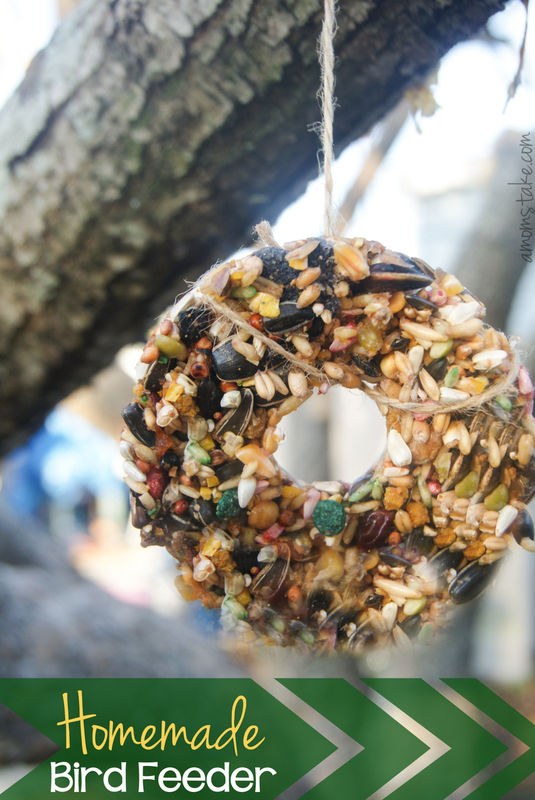 What shape would you make your Homemade Bird Feeder?